Dolerites of the parallel dikes formed in a back-arc spreading setting have been dated by Sm–Nd to the Silurian (426 ± 34 Ma) for Mount Azov in the Central Urals. The age coincides with that for zircons (428.5 ± 3.7 Ma) from the East Ural Megazone dolerites, which indicates the regional extent of the back-arc spreading processes. 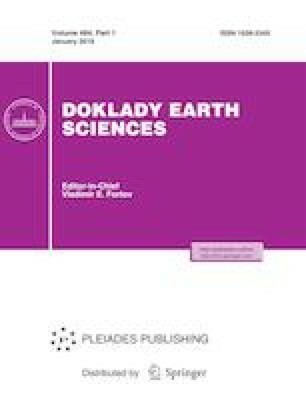 Study of the ontogeny and mineral inclusions in the Middle–Upper Devonian zircons from the dikes of Mount Azov showed that the formation of zircons occurred during regional metamorphism of the dolerite and hosting basalts. This metamorphism coincides with time of onset of the Late Devonian collision, when collision processes engulfed practically the entire region. The authors are grateful to I.V. Semenov for assistance in selection of the samples for Sm–Nd dating. The work was supported by the Comprehensive Program of the Ural Branch Russian Academy of Sciences (project no. 18-5-5-32).